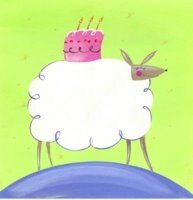 Betty the Sheep: Betty the Sheep – 1 Today! Betty the Sheep – 1 Today! Betty the Sheep is a year old today. It’s weird to think that I have been posting for a whole year on this blog. Although the posting tends to be a bit random both in subject matter and in frequency it has been a fun diversion for me. I think this blog has made me more aware of the vast array of subjects out there that can be blogged about. I hope to continue to put up posts for as long as I am enjoying it. After all where else could I freely extol the merits of BellX1 music on a regular basis? PS, what's happened to your cleaning tips? # posted by Donal : March 16, 2007 12:40 a.m. Thanks, but there is no way I've put up 15 posts exclusively devoted to BellX1! # posted by Betty the Sheep : March 16, 2007 10:32 a.m.
# posted by rat girl : March 16, 2007 11:02 a.m.
Ok, it's only 9 Bell X1 posts, I was exaggerating! BellX1 are set to play the Marquee in Cork on the 1st of July 2007. Tickets are on sale now from Ticketmaster! ... more aware of the vast array of subjects out there that can be blogged about. I hope to continue to put up posts for as long as I am enjoying it. After all where else could I freely extol the merits of BellX1 music on a regular basis? # posted by Donal : March 16, 2007 3:04 p.m. I just learnt to count so give me a break! # posted by Donal : March 16, 2007 3:05 p.m.
# posted by Betty the Sheep : March 16, 2007 3:12 p.m. Happy birthday betty....you are doing a great job. Your random subjects keeps me very entertained!! # posted by Anonymous : March 20, 2007 4:06 p.m.